One block at a time! 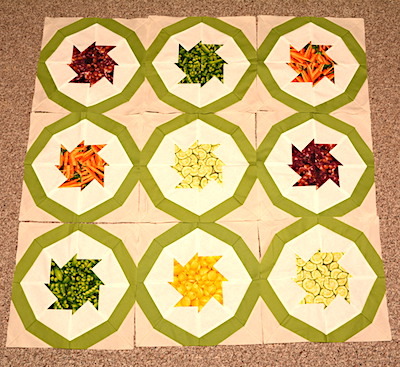 I’m making slow progress on my Whirled Peas quilt. I’m making 2 each of 10 different veggies and fruits. This is a paper pieced pattern by Amy Gibson called Tilt-a-Whirl. UFO – paper piece blocks for Whirled Peas. ✔️ 9 blocks completed and 11 more to go. Continue with FMQ Chic Country. This entry was posted on Tuesday, September 11th, 2018 at 18:49	and is filed under Quilting. You can follow any responses to this entry through the RSS 2.0 feed. You can skip to the end and leave a response. Pinging is currently not allowed. The blocks are fantastic! I love the different colored veggies in the centers. They really pop!